Ash Taylor believes the club is now more stable on and off the pitch that at any time in his 20 months as a Cobblers player, and is ‘in a great position’ to launch a serious bid to get back up to Sky Bet League One. The central defender joined on a three-year deal from Aberdeen in the summer of 2017, signed by Justin Edinburgh at a time when the club was in league one and aiming high thanks to investment from Chinese company 5USports. But it’s probably something of an understatement to say things haven’t gone to plan, for player or club. Since Taylor signed, the 5USports investment is no more, the Cobblers have been relegated to league two, and the club is on its fourth manager, with Jimmy Floyd Hasselbaink and Dean Austin being hired and fired following the sacking of Edinburgh. But things have looked up in recent months. 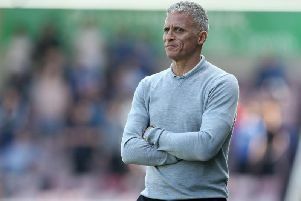 Keith Curle took the managerial reins from Austin in October, and in the six months since there has been genuine signs of stability and some real progression. The team have pulled away from the league two relegation zone they flirted with for the first six months of the campaign, and recent form has been so good there were hopes the team could sneak into the play-offs this season. Last weekend’s defeat at Cheltenham has perhaps put an end to that, but regardless of the result at Whaddon Road - which was the Cobblers’ first defeat in nine games - Taylor feels the club is now, at last, heading in the right direction. “I think the club is the most stable it has been, and that’s performance-wise as well,” said Taylor, who was named the supporters’ player of the year last season. Now 28, Taylor admits he didn’t envisage playing in the bottom tier of English League football when he joined Town after spending three successful seasons in the Scottish Premiership with Aberdeen. But that is how things have panned out, and he is now just keen to get back up the divisions. “I don’t want to be playing league two football for another year, but it is looking likely,” said Taylor. Taylor has seen for himself the potential the club has on and off the pitch, and believes the supporters can still play a part in the team making an unlikely charge for the play-offs this season. The fans rallied around at the back end of last season when Town were battling against relegation. There were big crowds at Sixfields and more than 2,200 travelled to the final away game at Walsall, and although Austin’s team ultimately fell short, Taylor was impressed with the backing the team got from the fans. “If we can put in the performances like we have, and get the backing of the supporters, then they can help us massively,” said Taylor. “We have seen it when we have been on a good run, they really get behind us, and that doesn’t half help the team, especially with the likes of the younger lads coming in and playing. Almost 650 supporters made the trip to the Cotswolds last weekend for the Cobblers’ disappointing 3-1 loss against the Robins, and Taylor says he still bemused as to what went wrong. “It wasn’t a great performance, and disappointing on our behalf,” he admitted. “We didn’t turn up, we got out-battled and it wasn’t like us at all considering the run we have been on, and the performances we have put in. “It was so disappointing to send the fans home unhappy, but I can’t put a finger on what went wrong, we just didn’t get near them. “We didn’t get in their faces like we have been, and Cheltenham played some good football as well which put us out of our stride a little bit.